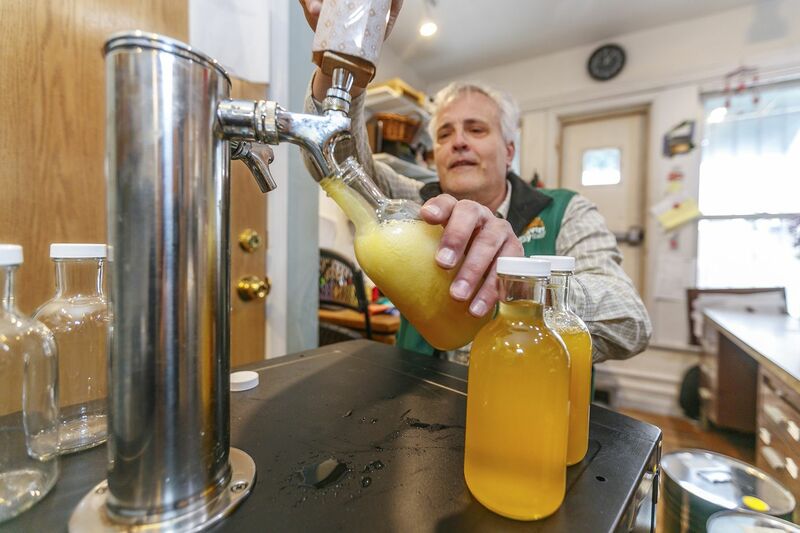 Weavers Way Co-op store manager Rick Spalek fills 16 ounce bottles with GT'S Cannabliss kombucha , which contains CBD, from the tap on the second floor of the Mount Airy store. Step away from those gummy bears. Surrender the smoothie. Put down that ice cream and that hot sauce. Under federal law, if those products contain CBD, they’re illegal. CBD, or cannabidiol, is derived from cannabis. It is a nonintoxicating compound reputed to have several health benefits. And this year, CBD’s popularity has exploded. It’s added to skin creams, oils, and dietary supplements. Soon, those products will be for sale at CVS, the largest drug store chain in the United States. Anecdotal accounts have claimed CBD to be somewhat effective as an anti-psychotic, a calming agent, and a pain reliever. CBD from hemp is also being added to foods. It’s in the kombucha called Cannabliss at Weavers Way co-ops. It’s in the muffins, coffee, and lollipops at the Hip Hemp Cafe in South Philadelphia. It turbocharges drinks at the Fuel lunch counter in Center City. Rocky’s Hot Sauce, produced in Oreland, purports to pack 100 milligrams into tiny bottles of fiery elixer. Restaurants structure menus around it as an ingredient. Though Pennsylvania and New Jersey regulators are turning a blind eye, it may become a source of serious agita for vendors who lace their edibles and drinks with it. The U.S. Food and Drug Administration prohibits the addition of CBD to prepared foods. That’s despite language in the 2018 Farm Bill that loosened restrictions on the interstate commerce of hemp — cannabis that contains less than 0.3 percent of THC — and its derivatives such as CBD. Even advocates and researchers advise caution before consuming it. The federal stance has triggered crackdowns by a number of states and municipalities. The New York City Health Department sent letters last month warning that after Oct. 1, violators will face fines, “embargoes,” and a slashing of their all-important health letter grades. Los Angeles will soon start penalizing companies that have “adulterated” foods with CBD (though a law pending in the California legislature could permit sales statewide). States banning CBD in food include Ohio, Maine, North Carolina, and South Carolina. But major retailers such as Whole Foods are exercising caution. “Whole Foods Market will not sell products containing CBD (cannabidiol) until all issues regarding the regulatory status are completely resolved to our satisfaction,” a spokesperson said. Until last year, there was a federal ban on CBD, not that the FDA enforced it. Beyond firing off a few letters ordering manufacturers to stop making unproved health claims, the FDA made no efforts to stop commerce. After all, CBD has never killed anyone. Because CBD is extracted from cannabis, it long has been considered a Schedule 1 substance, along with all other forms of the marijuana plant and its derivatives. But because CBD doesn’t get anyone high, it existed in a gray area. CBD oils and tinctures quietly were sold at health food stores and head shops. Last summer, the FDA approved a highly purified form of CBD as a treatment for some rare forms of childhood epilepsy. The CBD drug, Epidiolex by GW Pharmaceuticals, may cost uninsured patients up to $32,500 a year. The FDA’s ruling initially was cheered by activists and advocates who assumed that all forms of CBD would now be legal. Not so. Before FDA Commissioner Scott Gottlieb abruptly resigned this month, he told Congress the agency would hold listening sessions to discuss hemp and its derivatives. A public meeting is scheduled in April to explore how CBD could be sold legally in food beverages and supplements. The FDA can listen. But it is bound by law. The drug exclusion rule prevents any active substance in a pharmaceutical from being added to a food, pointed out Erika Lietzan, an associate professor at the University of Missouri School of Law. Given the FDA’s priorities, enforcement of the statute is likely to remain sporadic. And for most merchants, the rewards for selling the products outweigh the risk. That’s because there’s something magical that happens when a few drops of CBD are added to food. The price of a fruit smoothie increases by $2.95. The cost of a can of CBD-infused sparkling water can soar to $3.99, $8.99, or more. A CBD lollipop can run you $5. The wholesale price of a few milligrams of bulk CBD isolate is rarely more than a few pennies. Analysts at Cowen Investment Management “conservatively” expect CBD products to reach $16 billion in sales in the U.S. by 2025. Cowen estimated the CBD market launched in 2014 with a few million in sales. Four years later, in 2018, CBD generated revenues of between $600 million and $2 billion. Some analysts believe the CBD industry could overtake a legal recreational marijuana market. Consumers should think twice before taking the substance, whether in food or as a nutritional supplement, researchers and advocates said. “We don’t yet know if it’s safe to add cannabinoids to food and at what amounts,” said Marcel Bonn-Miller, a scientist who investigates cannabinoids at the University of Pennsylvania. “We need proper studies to determine what amounts of each cannabinoid, or cannabinoid combination, is safe in foods. The good thing is that there are guidelines from the FDA and companies are working to figure out the answers." Without regulation, consumers have no idea if what they’re paying for is pure, potent, or free of toxic substances, or if it even contains the compound. “It’s a pity that the regulatory agencies aren’t doing their job,” said Martin A. Lee, the author of Smoke Signals, a Social History of Marijuana — Medical, Recreational and Scientific and the director of the California-based Project CBD, a nonprofit advocacy group promoting research into the substance. Vendors said that if the FDA or local regulatory agencies decide to clamp down, they’ll comply. CBD fruit smoothies are a popular item at the Fuel Recharge Yourself Restaurant in Center City, said the chain’s CEO, Rocco Cima. “We haven’t heard anything negative,” Cima said. "But at the end of the day, if the FDA comes down, we’ll abide by the rules."